John Harding (b. 1940) is a photographer based in San Francisco. 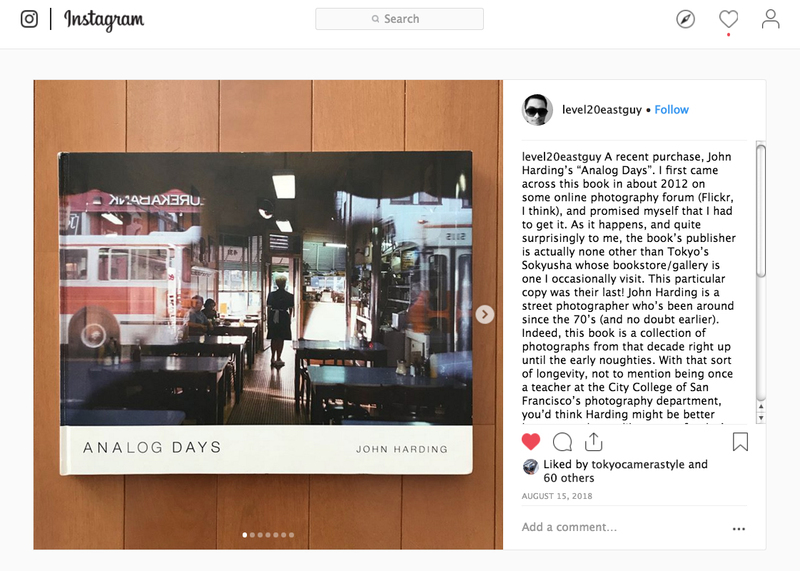 His book Analog Days was my favorite photobook discovered in 2018. More of his photos can be found on his website, and in the online collection at SFMoMA. BA: Where did you grow up? I grew up in Granite City, Illinois across the river from St. Louis. Worked at Granite City Steel, went to SIU, Carbondale, Il. Travelled thru Europe, camping for a year. JH: How and when did you first get into photography? I had my first camera, one I got with Blue Chip Stamps after I saw the movie Blow-Up. How did you wind up in San Francisco? Got a job in San Francisco that I didn't like very much. 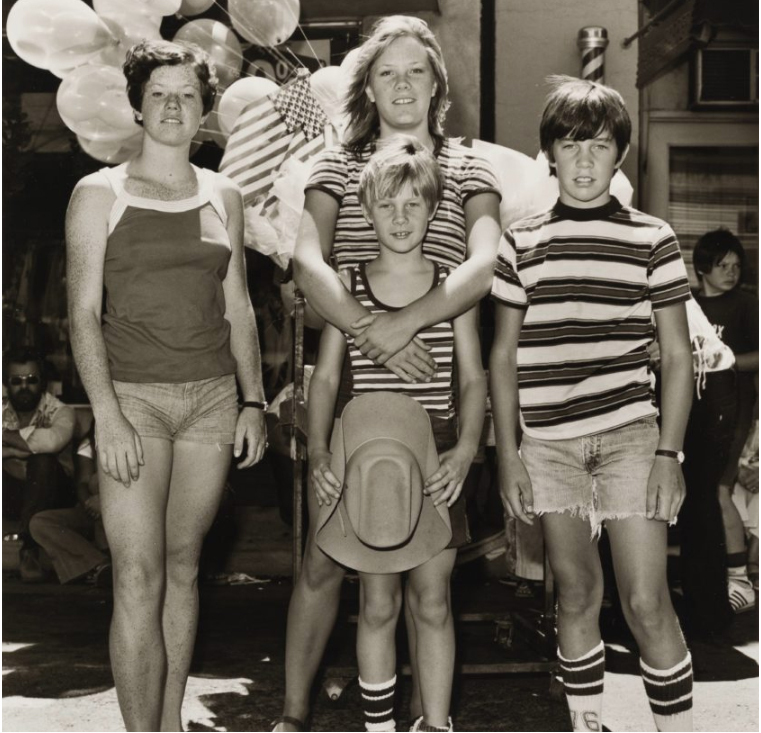 Started taking photographs of Siblings that turned into a B/W book, which got me into graduate school at SFAI. Henry Wessel was one of the teachers at SFAI and Garry Winogrand visited the class. I learned from them what a photograph could be. I began to photograph in color everything that interested me. Sandra Phillips saw and exhibited the work as did John Szarkowski. I read everything they and others wrote. What other photographic training did you have? I was also freelancing for Fortune, Newsweek and other magazines. There was a lot of work, you just had to be competent and show up. In fifteen plus years I did over a thousand assignments. It supported my work. Did you also make photos for yourself during those commissions? Or did you keep your personal work separate? Yes, the work is separate because assignment work is problem solving and personal work is about seeing things that you are not trying to solve but to experience. Does the process of looking for photos sometimes interfere with experiencing things? Experience and looking are the same thing. What did you do after freelancing? Later I had a part-time job teaching Editorial Photography at SF City College. There were many good students making great photographs. A couple of times a year I would go out to Hank (Wessel)'s with a hundred or so work prints. He would do a Yes stack and a No stack of prints. Nobody knew the possibilities of photography better than Hank. Hank Wessel edited Analog Days and the new book Streets of Discontent. I thanked him for what was there and more importantly for what was not there. I love the idea of Yes and No stacks. I'm curious how often you disagreed with his choices. Did you trust him fully with the edit? Or were there certain photos, either Yes or No, that you decided to part from Wessel? I fully trusted Hank Wessel and came for his advice and did not want to amend it. And in the final edit I used photographs that he did not recommend but spoke to me. How did the resulting book Analog Days come to be published in Japan? Because I was there and showed work to the publisher. The captions in Analog Days are extremely specific, down to the exact date. Can you tell me something about your archiving/filing system, which allows such specific indexing? I just date the film as I shoot it. Now that Henry Wessel is gone, do you have a community or close group of friends with whom you can share photos? No community of close friends, Photography is alone activity. Thankfully. I photograph everyday and the world is a wonder to me. When and why did you begin using flash with your street photography? I use flash very seldom and not at all in the latest book. Can you tell me anything more about your process? I shoot everyday and follow the light, try not think or expect too much. I go where the people gather like birds. I am the birdwatcher. Blake, I was at Sōkyūsha yesterday; if they don't have Analog Days, they do have copies of Streets of Discontent (again, for a lot less than the price in the US), and of Trees Places and People and the 2016 Siblings (not a reissue of the 1982 Siblings but a supplement to it). If you like Bill Owens' Suburbia then take an opportunity to look at Siblings -- I haven't seen the earlier book, but copies are so cheap via Abebooks that I ordered one. (It's perhaps a slightly newer edition of another book, Geschwister, which again I haven't seen.) Harding is curiously laconic on his website about this kind of thing (and indeed about anything else). Anyway, I went home, looked at my new acquisition, went to bed, and woke to discover this brand new interview of yours. Thank you both! Thanks, Peter. Haven't seen any of his other books yet. They are not easy to find here. Maybe that's how he wants it? This is my first foray into your blog. Wessel has always been confusing to me. I like the birdwatcher term, I've started to become more of a literal birdwatcher and less of a photographer lately haha. I look forward to reading more of your blog Blake.